Joe Mason has signed for Wolves for a fee though to be worth up to £3.5m. It seems strange to think we are letting first team strikers leave for another Championship club but Mason hasn't quite been a force in the City side this season. Whether that's down to the player or the role he's been asked to play I don't know. 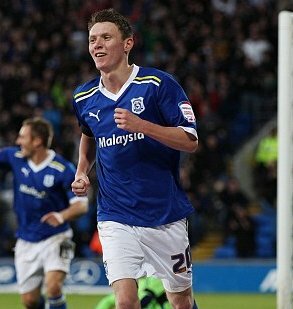 Mason of course scored City's goal in the 2012 Carling Cup final during his first season at CCS. He was always a fans favourite but there has been questions asked about his pace this season and his lack of consistency in front of goal. He started the season well with 5 goals in his first 10 appearances but only one goal has followed since the beginning of October. With City light on the ground for strikers I hope it's not a financially motivated move just to get some quick cash in. Mason has proved he can play at this level. I wish him the best but hopefully not at our expense. “When an opportunity like this arises you can’t turn it down and I am looking forward to getting settled and showing everyone what I can do. “I played at Molineux recently and it’s strange how it works out that now I am a Wolves player. “That was a good day for Cardiff and I could see from the atmosphere and the stadium and fans that it is a good place to play and I can’t wait to get out there and make my debut. “With the size of the club here obviously the main aim is to get promoted. “That is what the gaffer has spoken to me about and there is no reason why we can’t do it. “This season? Why not. There is still enough games left and last season Wolves had a really good run towards the end and nearly got into the play offs.